The five-year study will look at individuals with three commonly associated diseases – chronic kidney disease (CKD), diabetes, and hypertension – across a variety of healthcare settings, to determine which practices are most effective in reducing hospitalizations, readmissions, cardiovascular events, and mortality. About 14 percent of the adult population in the U.S. have chronic kidney disease, about 10 percent have diabetes, and about 33 percent has hypertension. Moreover, about half of those with CKD have diabetes, and a large proportion have hypertension. Key to this model is delivery of evidence-based interventions in collaboration with primary care practitioners in the community setting where patients receive most of their care. “Dr. 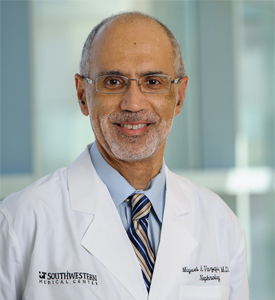 Vazquez’s project puts UT Southwestern on the playing field with the most prestigious academic health centers conducting clinical and translational research anywhere in the world. This innovative research project to improve outcomes in these three crippling chronic diseases using cutting edge information technology is real “meaningful use” of the electronic health record,“ said co-principal investigator Dr. Robert Toto, Associate Dean for Clinical and Translational Science, and Professor of Internal Medicine and Clinical Sciences, who holds the Mary M. Conroy Professorship in Kidney Disease. The project, called Improving Chronic Disease Management with PIECES (ICD Pieces), will be primarily overseen by the National Institute of Diabetes and Digestive and Kidney Diseases and secondarily by the National Heart, Lung, and Blood Institute. It is one of three recent research awards totaling up to $19.4 million over five years and supported by the NIH Health Care Research Collaboratory to address the growing proportion of the U.S. population that has multiple chronic medical conditions. The study relies on a novel information technology platform called PIECES, developed by Dr. Ruben Amarasingham, President and Chief Executive Officer of the Parkland Center for Clinical Innovation (PCCI) and a co-investigator on the study. The PIECES platform will utilize electronic health record data for data collection, early disease detection and monitoring and care coordination for patients with chronic medical conditions. PIECES extracts data from electronic health records to identify and sort in real time patients at high risk for adverse clinical events. This process helps providers improve patient safety and care quality by allocating resources to the right patients at the right time. The four participating systems — Parkland Health & Hospital System, Texas Health and Resources System, VA North Texas Health Care System, and ProHealth Physicians, Inc. — were selected to make the results broadly applicable across various patient populations and various types of health care systems, including safety net hospitals, facilities caring for veterans, accountable care organizations, and private hospital systems. ProHealth Physicians of Connecticut cares for an outpatient population of approximately 350,000, including 90,000 with hypertension, 26,000 with diabetes, and 25,000 with kidney disease, said John Lynch, Vice President of Research and Government Affairs at ProHealth. “In order for us to provide optimal patient-centered care, it is essential to identify disease at its earliest stages, segment our population by predictable risk, identify the optimal interventions by risk category, and adjust care plans for patient-specific circumstances, especially accounting for interactions for those with multiple chronic conditions, and achieve the triple aim – appropriate access, highest quality, at lowest possible cost,” said Mr. Lynch. Currently 8,404,602 veterans are enrolled in the VA system nationally. The prevalences of CKD, diabetes and hypertension are 20 percent, 34 percent, and 68 percent, respectively, which are all higher than corresponding percentages of patients enrolled in Medicare. The grants are funded through the National Institutes of Health’s (NIH) Health Care Systems (HCS) Research Collaboratory, which engages health care systems as research partners in conducting large-scale clinical studies. The HCS Research Collaboratory, created by NIH in 2012, currently supports five large-scale clinical trials with partnering health care systems across the United States and a Collaboratory Coordinating Center at Duke University. The funds are managed through the NIH Common Fund, which encourages collaboration and supports a series of exceptionally high-impact, trans-NIH programs.